Your sales and marketing team have diverse tasks to perform while keeping communication free and open all the time. Using the right tools for each task will go a long way in making every aspect of your business highly productive. And while there’s certainly no dearth of productivity tools today, some of them have a distinct edge over the rest in terms of their specific functions. In this guide, we’ll discuss the best tools for maximizing marketing productivity and highlight their features and advantages to maximize the efficiency of marketing teams big or small. 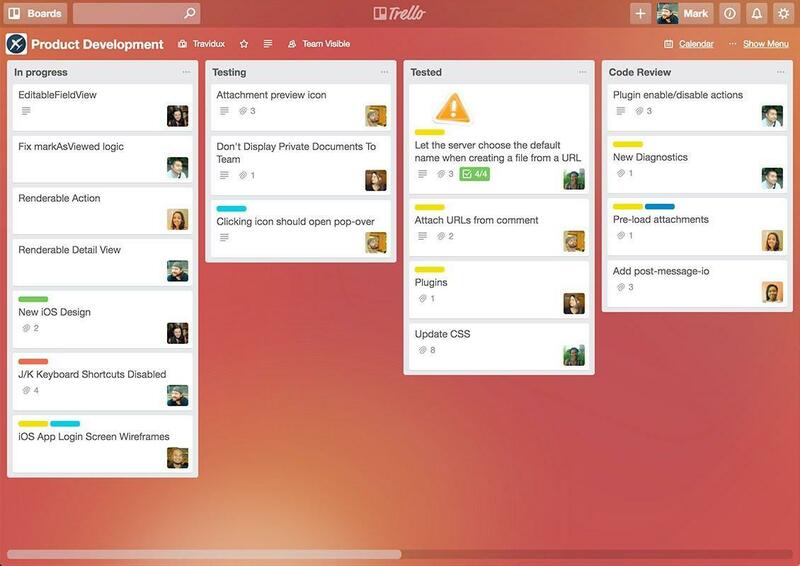 Trello is one of the leading collaboration and project management tools available today. Although Trello was primarily meant for agile software development teams, its utility makes it apt for other departments marketing, sales, support and HR. The tool uses the concept of "boards" that hold “cards” (representing various tasks). Cards can contain lists that are used to track the progress of any project. They can also simply categorize things that your team needs to do. Trello is extremely helpful for creating, organizing, and prioritizing actions across different teams. You can even define workflows, assign tasks to individuals or teams, set deadlines and monitor progress. From planning meetings to collaborating with team members to organizing different tasks, you can accomplish anything using Trello. You can get more work done together. Trello has the flexibility and features to fit any team’s style. You can organize and track all of your teams’ tasks, files and project statuses in one place. You’ll find everything with search, filtering and labels. Asana is another of the most popular project management tools currently available on the market. It can efficiently manage most of your communication and collaboration tasks. Businesses praise it for accuracy and efficiency. 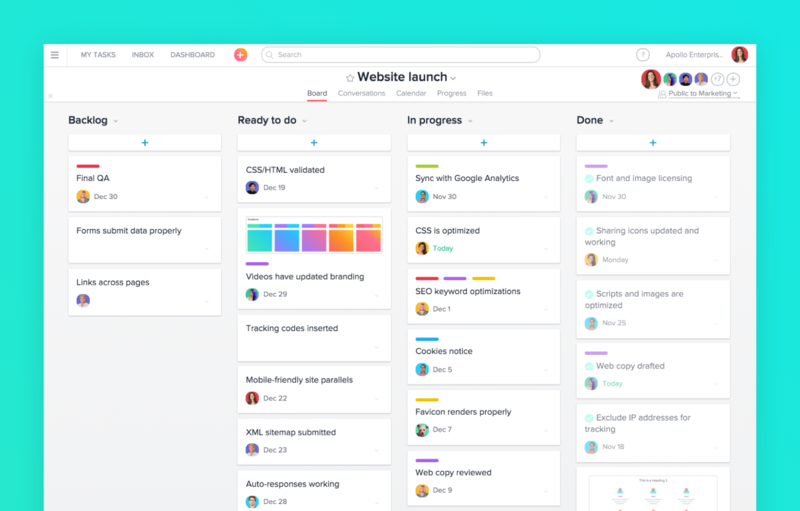 As a powerful work management platform, Asana helps you stay focused by easily allowing you to set priorities and deadlines, share details, and assign tasks — all in one place. You can use it directly through a web browser or its smartphone application. With Asana, it is extremely easy to manage multiple projects, tasks, and sub-tasks. It simplifies incoherent record of communication-related to various tasks. You can easily prioritize tasks by moving their positions on the list, revising due dates, and changing the task class. It’s a powerful software to facilitate collaboration, you can invite people to join Workspaces. 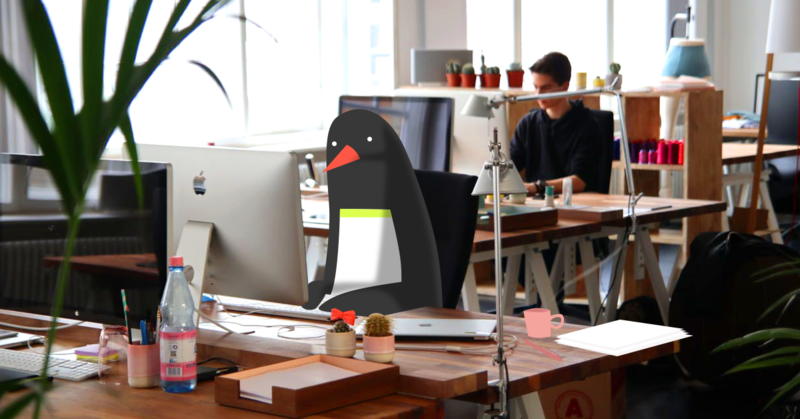 Members of a Workspace are able to see all the projects and tasks in it. Time Doctor is a time tracking and productivity measuring tool, which is excellent for businesses with distributed or remote employees. It’s easy to use and has smart features that help you focus and complete your most important tasks. Apart from tracking the total time, Time Doctor provides a breakdown of how much time is spent on each project, client or task. It also generates detailed reports for completed work, which in turn provides helpful business information. Its pricing starts from $9.99 per month. Drive efficiency and productivity at work. Stay concentrated on your work and get alerts if you are losing attention. Monitor apps and sites to get details on how time is spent on work online. You can integrate with other apps like Workflow Max, Teamwork, Podio, Trello and Asana. The tool helps you remotely record computer screenshots, which is useful for monitoring off-site employees. 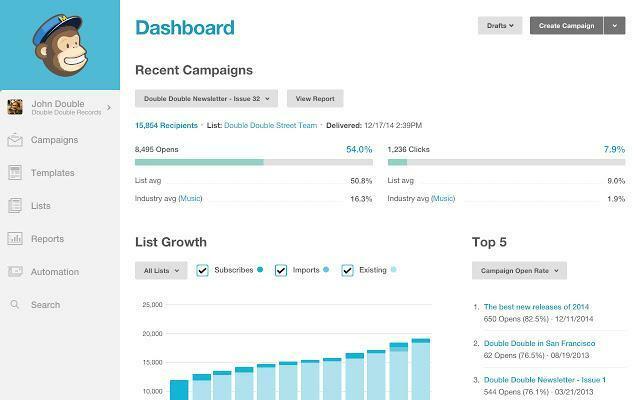 With MailChimp, you can also generate custom reports, manage subscribers and view un-subscribers. Create custom designs on your own or choose from an array of prefab templates or campaigns. Send up to 12,000 emails to 2,000 subscribers for free. 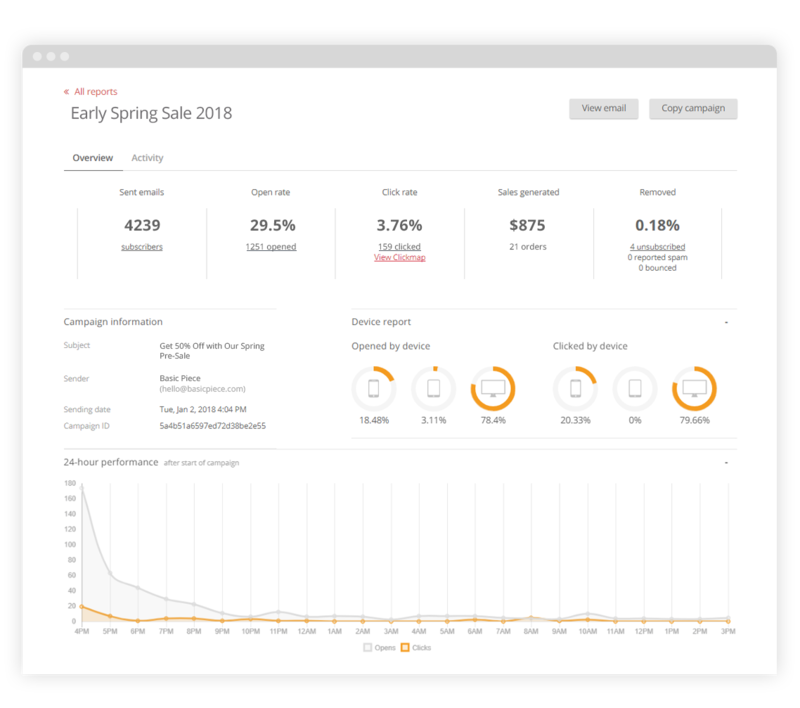 MailChimp has a flexible user interface and they give you many options for making your email campaigns your own. MailChimp seamlessly syncs up with different CMS and lead gen platforms, which is extremely helpful when you are capturing emails on your website. You can easily login to your account, select the list, create emails, and send them without any importing at your end. Use easy and insightful reporting and analytics. 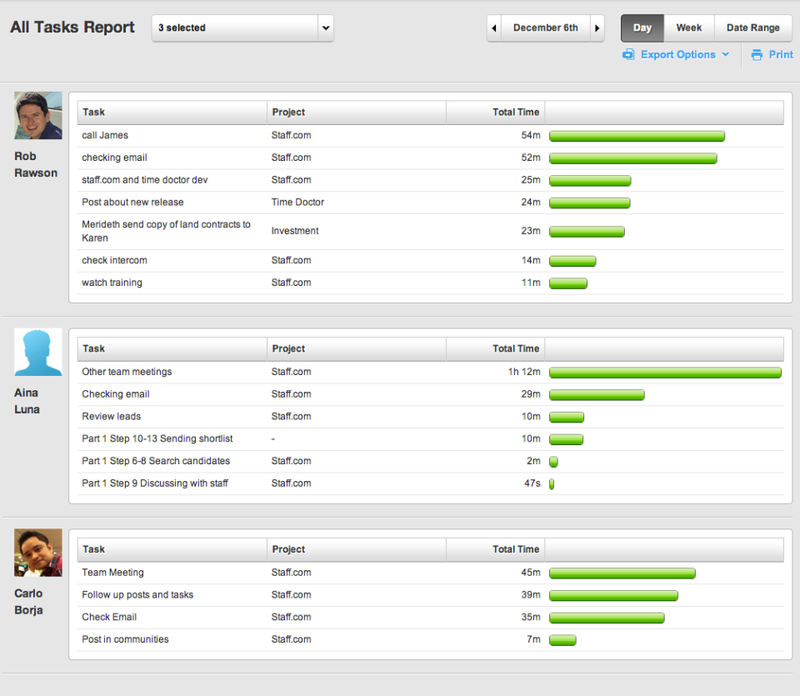 The reports can be viewed on mobile devices and you can easily export them to share with team members and clients. Infusionsoft is a robust tool for online businesses, brick and mortar stores and local service providers. One of the biggest advantages of using this tool is it integrates seamlessly with third-party software applications (including some of the tools in this guide). 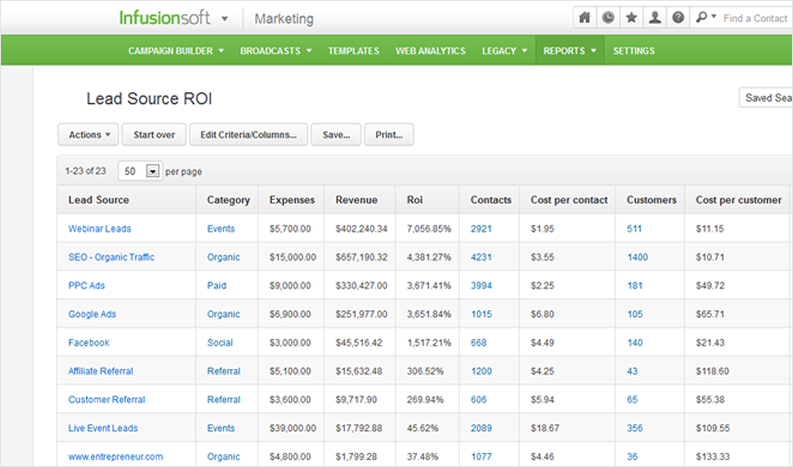 Infusionsoft helps you automate routine tasks, and create and implement effective sales and marketing strategies. It also enables you to capture data about your customers so you can build closer and more profitable relationships. 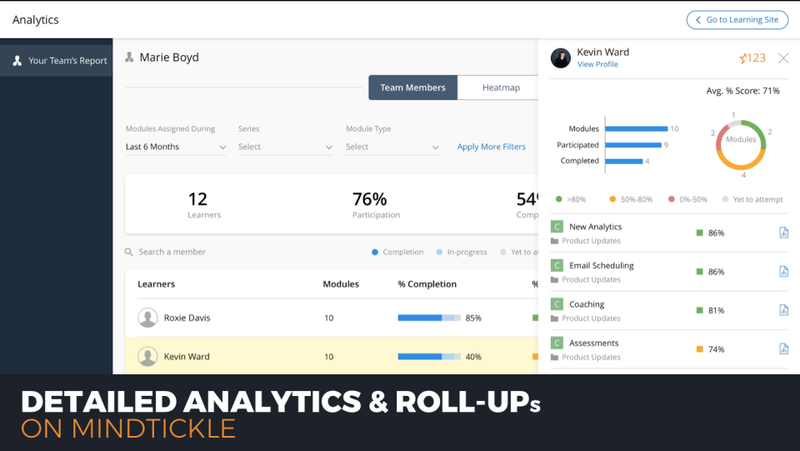 Use this tool to map out each step of your sales and marketing strategy as well as automate repetitive tasks such as follow-up emails. You can segment your customer lists by separating them into target groups and tag them easily. Save time and streamline your workflow by easily automating repetitive tasks. It puts almost everything small businesses need for marketing into one system and allows you to do all of that in one place. Use it effectively as a CRM system to build more value for your customer relationships. The drag-and-drop form builder allows you to customize branding such as messages, images, and colors, without requiring any coding. OptinMonster’s detailed analytics measure the engagement of your customers. OptinMonster utilizes Exit-Intent Technology to help you track visitor behavior and identify when and why customers are about to leave the site so you can serve targeted campaigns to retain them. Using the advanced drag-and-drop builder, you can create or modify a form within minutes. You can attach attractive floating bars, slide-ins and lightbox popups for faster email signups to improve the experience of your visitors. The new mobile addon allows you to create beautiful mobile-only forms. You can create an unlimited number of A/B split tests with notes to keep track of your incremental changes and tweaks. The new version of OptinMonster has built-in integrations with HubSpot, Emma, TotalSend, and Customer.io. MindTickle is a sales-readiness platform for onboarding, product training, and coaching. It helps business prepare their sales team and partners in a scalable and highly effective manner. The data-driven analytics of MindTickle provide useful insights on how sales readiness programs are impacting revenue growth. The robust platform tracks pre-work as well as post-work reinforcement, which ensures that in-person training and coaching is effectively absorbed and implemented. This maximizes the impact and reduces the costs associated with these trainings. The pre-work session allows individuals to prepare beforehand so that the remaining time can be utilized for discussion and practice. Post-work and ongoing learning, on the other hand, can be easily delivered in micro-learning modules. In a nutshell, MindTickle solves problems in three key fields — new hire onboarding, sales enablement, and product training. Administrative integration and behavior monitoring. With simplified learning, sales reps are able to record audio or video of their practice pitch or demos for feedback. Digitization of learning provides flexibility to reps and managers alike. The sales coaching and readiness become a part of the day-to-day routine. Personalization ensures that the material viewed by each rep is specific to their learning needs, which ensures continuous growth. Share best practices amongst team members. 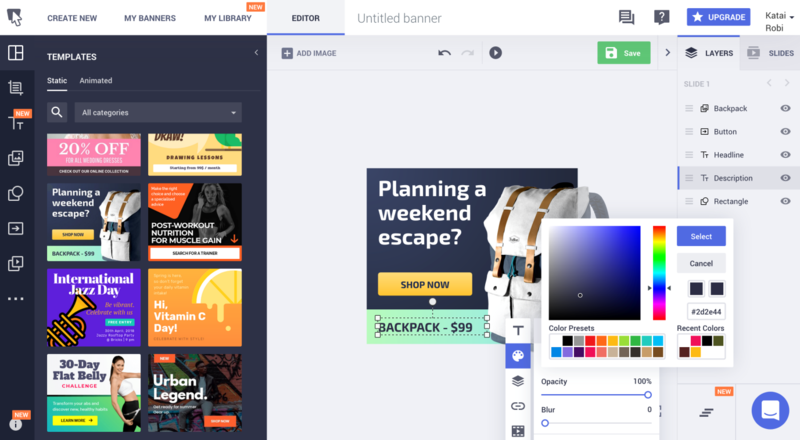 Bannersnack is a banner ad creation tool that has a wide array of features for increasing productivity for your marketing team’s designers. It allows you to design and create banner ads as well as manage and implement display advertising campaigns across different marketing channels. These ads are also compatible with numerous social media sites. The tool has hundreds of thousands of built-in assets such as stock photos, fonts, text presets and clipart. Bannersnack ads are compatible with major display ad networks such as Google AdWords, AOL Advertising, RightMedia and OpenX. Designing an ad is quite simple and easy and doesn’t require a significant amount of time on training. You can give your ads an edge by adding interactive elements. Easily integrate your ads to social media posts using Bannersnack. Sketch is a new tool for mobile and web interface mockups. Most of the tools you’re used to using in Illustrator are readily available in Sketch and it’s quick to learn even if you aren’t a proficient designer. In the past few years, there have been a bunch of incremental updates to help you quickly and easily apply effects and modifications to your banners. 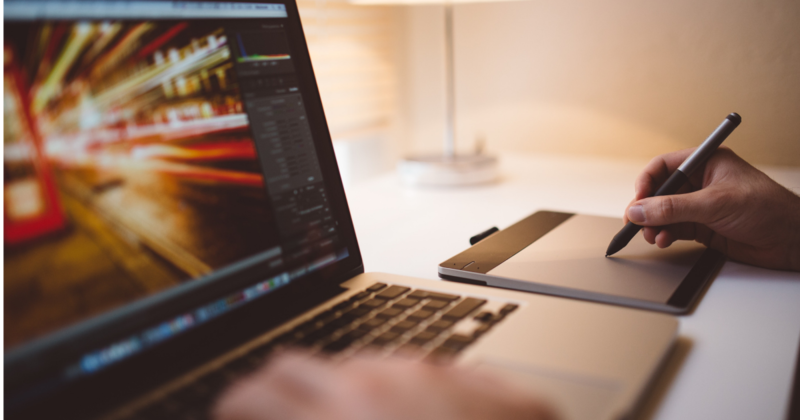 Experiment with different designs, images and layouts using its powerful editor. The only drawback of this tool is it is a platform for Mac only. 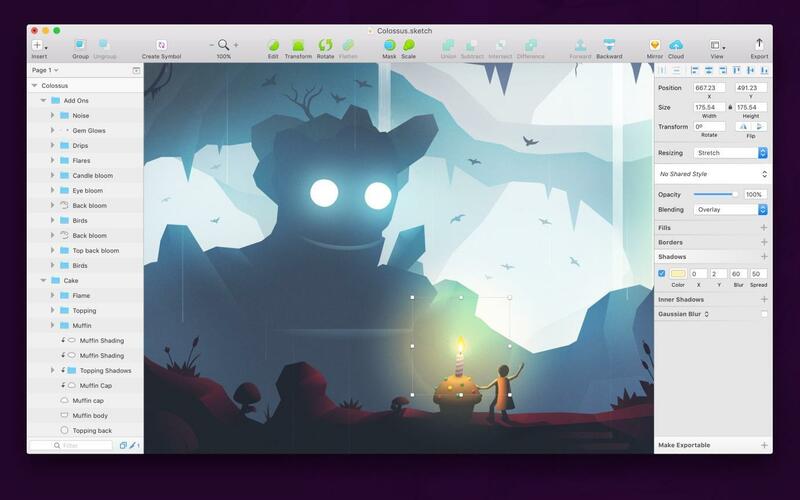 With Sketch, you can modify your images and still revert back to the originals (non-destructive editing). "Symbols" allow you to create icons, avatars, and other design elements and save them for future use. You don’t have to repeatedly create these elements on other visuals. Easily add pre-loaded screen templates as artboards. Still building out your team? Read our guide to building an SEO team from scratch. Starting or running an agency? Follow the best practices for digital agency pricing. Generate new leads and sales using a website auditing tool. We've got one additional tool to share with you to make your marketing team as efficient as possible! Omnisend is an omnichannel marketing automation platform that lets you communicate with your customers via email, SMS, Facebook Messenger or even push notifications. Deep integration with ecommerce platforms let you setup Omnisend automation workflows, contact forms, and landing pages without any programming skills. Ominsend can replace small plugins and you will have everything in one tool: different lead forms, landing pages, predefined marketing automation workflows, advanced visitor segmentation, and even SMS marketing. On their free plan you can send up to 15,000 emails per month. Different forms: landing pages, signup boxes, popups. SMS, Web Push notification, Facebook Messenger. Deep integration with popular ecommerce platforms. Flexible segments: Target not only customers that have just placed orders with you, but also those that opened and clicked on your campaigns. Omnichannel marketing communication. 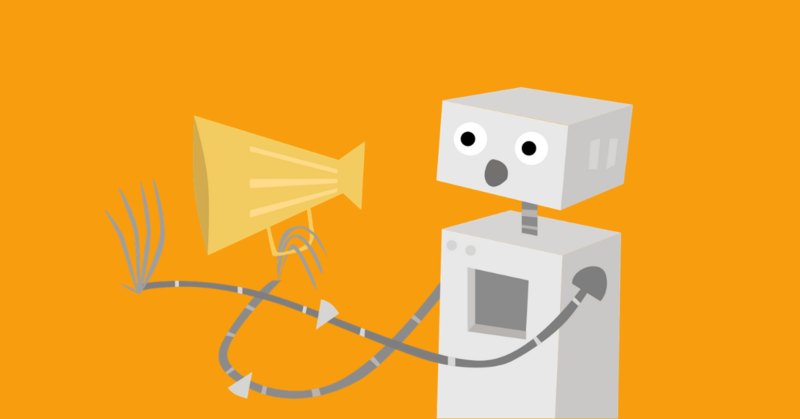 You can include different channels directly within marketing automation workflows like SMS, Facebook messenger or Web push notifications.